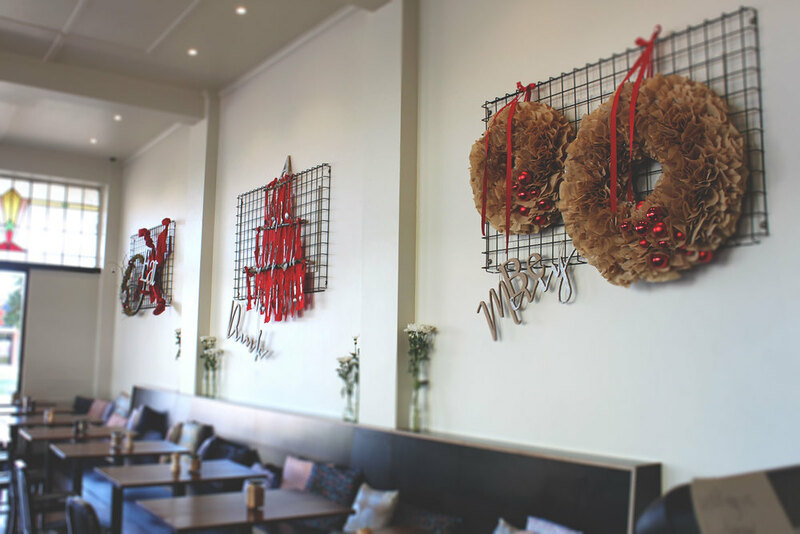 With a emphasis on cafe items, we designed a quirky hand-made display for this eclectic Cafe's first Christmas celebration. Upon the cafe walls of Little Alice featured three key components of their hospitality vibe. 1. A moss wreath upon a vintage bicycle wheel with tea bags and tea cups. 2. A Christmas tree with suspended hand-dipped glitter vintage cutlery. Of course an 'A' for the star on top. 3. Large Xmas wreaths of paper coffee filters with glitter edging. All hand made for added texture.